I present to you the new Crowdfunding Collection #72 – Part 3 of 3, including every tabletop project started between 03.05 and 03.25. Thanks to the sheer amount of projects started within the past three weeks, I decided to split the collection into three parts. This part does contains the other half of all the English projects. In regards to the games I am swayed by Gears of Defiance on the one hand. The d6 system as explained presents an interesting angle to the rather „normal“ steampunk setting, as does the focus upon oppression, family bond and revolution. Given both aspects I decided to back it and recommend a look. On the other hand there is Imp of the Perverse. A story game inspired by the short story of Edgar Allen Poe. The characters face possession of the titular Imp, who tries to pervert their very being by the offer of power. Transforming them into monsters should it succeed. The characters are not only out to rid themselves of their imp, but to protect society from monsters who fell victim to their vices. The conflict is set in the Jacksonian era of American Gothic. Well and the whole project is something I couldn’t resist backing. Another interesting game is Dragons Conquer America. Which returned in a second attempt of funding the awesome looking game about the struggle for the Americas – with Dragons! It’s vibrant, colorful, designed with expertise and care and I do really like the project. I supported the previous one, and am currently trying to squeez it into my budget. Fans of Savage Worlds can look to Savage Tokusatsu to get a game full of Mecha & Kajiu action or to enjoy hunting dinos with The Dinosaur Protocol. 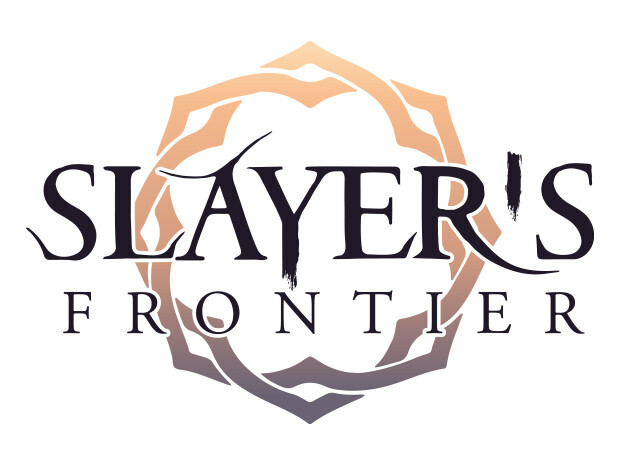 Slayer’s Frontier offers a colorful game that looks like a mix of Slayers – the Anime – and Monster Hunter – the Japanese video game – yet being flexible funding on IndieGoGo sees my interest plummeting. If you rather like Sword & Sorcery you might like to take a look at Heroic Tales of Aglaeca. In regards of the dice, I do like the design of the Elder Dice and the The Dice Pen looks like a cool idea. Then there is Hermetica – A Library of Occult Symbols, which offers an interesting typefont filled with occult symbols. Well, and if your a fan of D&D 5E, PFRPG or Starfinder you’ll find loads of supplements and adventures. Join the revolution as a family of characters, connected by unique bonds, banding together in the face of oppression in this RPG. Hunt down monsters in order to save yourself in this RPG inspired by the work of Edgar Allan Poe. Can you resist your Imps temptation? Historical fantasy tabletop RPG with an intuitive system to control your luck set in Mesoamerica during the 16th Century. A Rulebook for a Pen and Paper RPG set in a Mythologised Old West setting, with heavy emphasis on player individuality and engagement. A monster-hunting roleplaying game, where fast action and correct tools decide your success. Transforming heroes, kaiju running amok, giant robots versus the monster of the week, and more built for the Savage Worlds rule set. A full-color, hardcover book filled with 100 5E monsters. Each monster will be illustrated by Eisner nominated artist Travis Hanson! Maps, characters, gods, history, and lore describing a richly-detailed fantasy campaign setting in the world of Dark Obelisk. A psionics ruleset for the Starfinder RPG from Paizo by Dreamscarred Press, giving you new races, classes, feats and items! A guide to help you make the most out of your skills in the Starfinder Roleplaying Game! For 4-6 characters, Level 1-2. 7 outdoor maps, 5 dungeons and 7 mythical creatures. Fifth Edition urban sandbox with 8 iconic PCs (or NPC rivals) & the Trade War adventure path in eastern fantasy noir steampunk Soburin! The Shadow over Dunsmore Point is a Mythos inspired adventure landscape for the 5th ed D&D rpg. It is for 4-6 1st level PCs. Agents of A.A.R.F is an exciting and dangerous romp through the Seven Realms of Layna, a land dominated by animal/human hybrids. Lovecraftian designs: Yellow Sign of Hastur, Sigil of the Dreamlands, and Mark of the Necronomicon. Includes magnetic spell book box. 5 New coin sets, 10 returning sets by demand, more bonus loot! Affordable LARP coins that look and feel medievalish. The „Parsec“ is a compact, innovative box designed to store and organize your Star Wars Destiny dice, deck, and accessories. The Dice Pen lets you carry around everything you need for thousands of dice games in your pocket, including the pen to keep score. Experience the supernatural reception of a century in this LARP event, coming to Ottawa in fall 2018. A riveting, gritty, live action role play experience, set in a world of high fantasy and deadly combat. Fight until one remains. Hermetica is the Helvetica of esoteric and occult symbols. 750+ esoteric symbols drawn with love in a consistent, minimalist style. Tome is an Android application that provides fun and interactive character sheets for tabletop RPGs such as 5e and Pathfinder. In the not-so-distant future gangs fight for survival in this strategic skirmish game. Narrative campaigns grow and develop your gangs.